Vitani is a character from Disney's 1998 film The Lion King II: Simba's Pride, sequel to the 1994 film The Lion King. She is the daughter of Zira, the older half sister of Kovu, and the younger sister of Nuka. Vitani's name was originally going to be Shetani, but as the word means 'she-demon' in Swahili, it was changed to Vitani, which can be taken as a portmanteau meaning 'demon of war'. She is voiced by both Lacey Chabert as a cub and Jennifer Lien as an adult. As a cub, Vitani is shown to be mocking and snarky as she doubts Nuka's ability to lead. 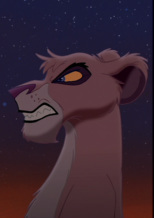 Like her mother, she is violent, wanting to engage Kovu in a fight as soon as Zira dropped him. Unlike Nuka, she doesn't seem to care to much about Kovu's being the Chosen One despite not being Scar's son. Vitani is determined and still violent as an adult, as well as mocking and tom-boyish. Only when she realizes the fighting is pointless do these traits get toned down a bit. 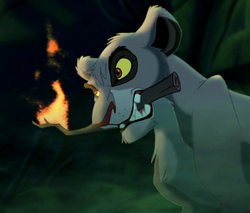 Vitani was born a Pridelander, as Kovu was the last born before they were all exiled. Very little information is available about her and unlike Kovu, who was initially loyal to Scar, stating that the lion was "a part of him" or Nuka who was merely out for himself, and disliked Scar for not choosing him to be king. 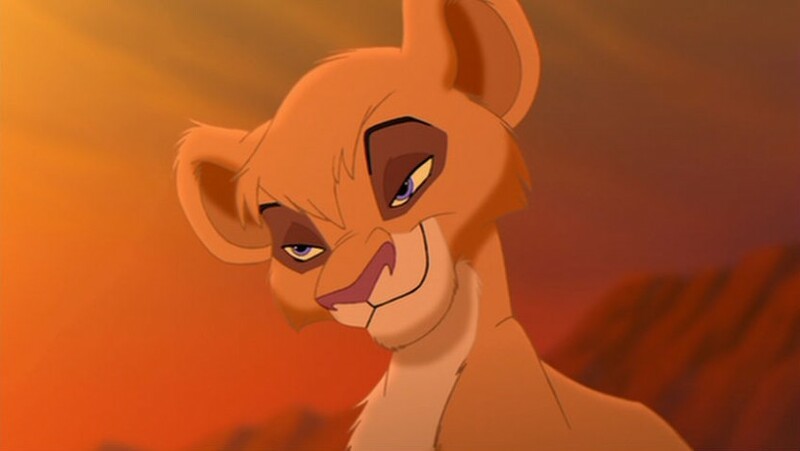 It isn't clear if she likes or dislikes him, but since she supports Kovu being King, which was Scar's decision, where Nuka does not, it could be said she liked him as well. It also hints that she likes him and cares for him much like Zira, when she participates in the song "My Lullaby"
As a cub, Vitani battles with a dry tree root, sparing her approaching older brother, Nuka, a glaring glance when she hears his complaining and starts to taunt her. She ignores him, and continues to tug on the root, only truly acknowledging him when he snaps it with a claw. Growling, Vitani rises asking Nuka about Kovu's whereabouts, displeased when the older lion makes it clear he doesn't care about Kovu's well being and has no intention or looking for him nor does he fear or care about Zira's wrath when she returns. She smirks at him when he complains about how he should've been the chosen one, not Kovu, to which Vitani responds "yeah right" daring Nuka to tell this to their mother and pointing out she has arrived when Nuka tells her he will. 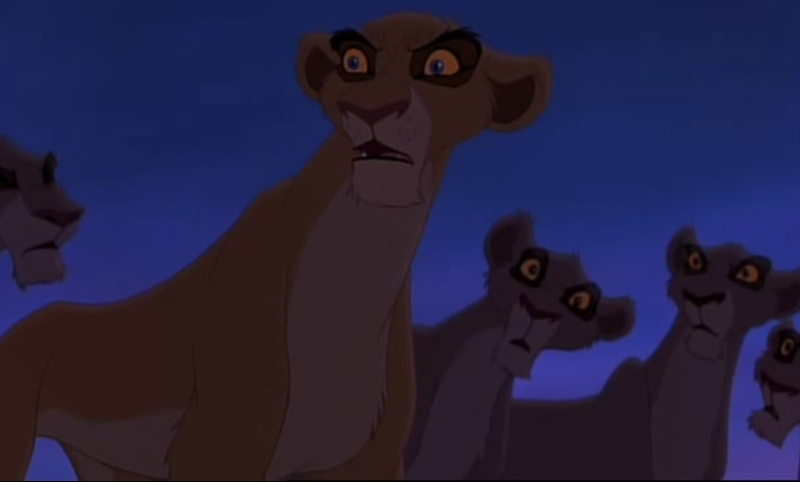 Zira ignores Nuka, depositing Kovu onto the dry, cracked earth where Vitani goads Kovu into a fight. Later, she is seen in "My Lullaby", singing alongside her mother and brother. While Nuka clearly dissapproves of Kovu becoming King, Vitani doesn't seem to mind, protecting him from Nuka and enthusiastically cheering "Kovu, what a guy!" upon her mother's request. Later, Vitani is once again seen side-by-side with her brother in the Elephant Graveyard. The two overlook the area, and Vitani scoffs at Nuka's discomfort from being there. She leaps down ahead of him, setting two sticks over a geyser, and smirks at Nuka when he is scared by one. Rolling her eyes, she picks up the lit shoot and the two head into the Pridelands, setting it on fire when they spot Kiara. During their arsoning, Nuka accidently surrounds himself in the flare, and after comically escaping, Vitani snatches him from view. After Kovu enters the Royal Den with Simba's approval, Vitani watches Kovu and Simba under the cover of the night sky, and enthusiastically, but silently urges Kovu to attack. She snarls, turning tail and fleeing from the Pridelands to report the news to Zira. Zira asks for definate confirmation about Kovu's betrayal and Vitani confirms it, as she saw it with her own eyes. During the ambush, Vitani takes up a position on Simba's back, sinking her claws into his shoulder and her hind claws into his hindquarters. When Kovu starts swatting some of the Outsiders away in an attempt to help Simba fend them off, she delivers a powerful kick directly at Kovu's head, sending him flying into a nearby bolder which knocks him unconscious. When Nuka tackles Simba off the ledge, Vitani is the first to lunge at him, missing by a mere hair. As Simba begins to climb the logs clogging the gorge and kicking some down in the process Vitani merely watches angrily as their target gets away. 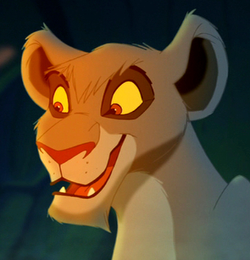 Kovu appears, and she waits for him to push Simba down to his death, but he doesn't so Nuka purues Simba instead. Both, Zira and Vitani watch in horror as a log gives under Nuka's hind paw and he plummets down towards the bottom of the dam and to his death. Vitani looks on as her mother savagely digs Nuka's head out from underneath the rubble, revealing his gasping form. He says his last words, and Vitani delivers a final "Nuka..." before hanging her head. 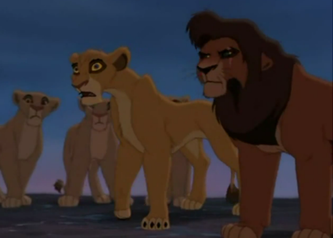 After Nuka dies, Zira directs her rage at Kovu, giving him the scar, and Vitani snarls alongside her at Kovu. After Kovu runs off, she eagerly listens to her mother for further directions as to how they claim the as their own. Vitani stays close by Zira as they intrude in the Pridelands, and chooses Nala as her opponent. They have a brief exchange, and then lunge for each other, rolling in the mud. The fighting goes on until Kovu and Kiara arrive, standing between their respective parent to keep them from fighting. Kiara explains "We Are One" to Simba, telling her the fighting must stop because it is pointless. Simba tries to counter, but Kiara explains that "them vs. us" is a false statement, as they are us. Vitani is the first of the Outsiders to realize what this means, and refuses Zira's order to attack, and stands by her brother, opposing Zira. Zira threatens her life, losing the loyalty of the Outlanders. Vitani is last seen when Zira pounces at Simba, and Kiara tackles her into the gorge. Presumably however, she joined the Pridelanders alongside her brother and pride even though she's never seen.